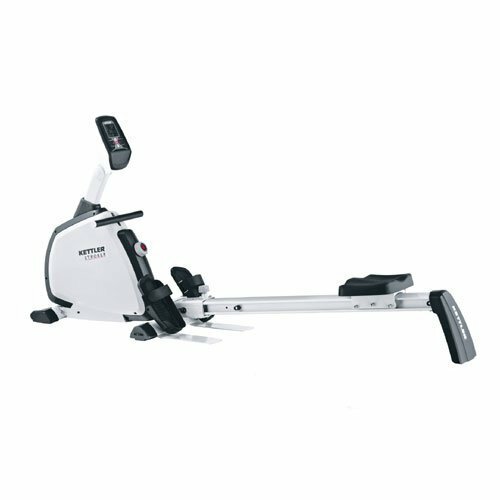 The Kettler Stroker Rower and Multi-Trainer is an excellent option for improving one’s muscular and cardiovascular health. The LCD display displays six functions simultaneously: Time, Distance, Energy Consumed, Strokes, Heart Rate and Frequency. The display also includes a recovery feature which provides a cardio wellness grading indexed 1 to 6 to track improvement. The rower is constructed with a sturdy, powder-coated steel frame for additional durability. The frame can also fold-up when not in use, reducing clutter and taking up less space in storage. Rower comes with a Magnetic Brake System in which resistant can be manually adjusted with indexed settings from 1 to 8, providing a wide and challenging range of resistance. Biomechanically correct footplates offer a natural pivoting action providing a full longitudinal rowing motion. The thickly padded seat provides maximum comfort and combines with top grade rollers for exceptionally smooth performance. The Kettler Stroker Rower and Multi-Trainer also includes accessories that attach to provide 10 additional exercises and a Polar T34 chest strap heart rate monitor. The LCD display requires 2 "AA" batteries that are included.